Fed up of being asked to keep your cymbals down? The Frequency Reduced FRX cymbals are a real departure for Sabian and could be a godsend for drummers who find themselves in situations where a lower dynamic is called for. 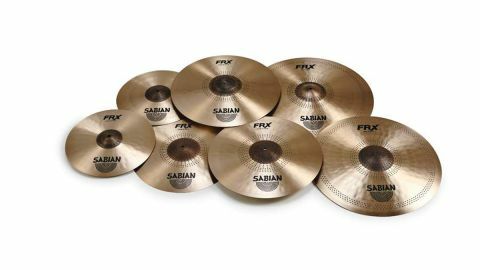 FRX is an entirely new concept from Sabian’s Vault. These are top-quality professional level cymbals that have numerous pin holes drilled into them. They appear to be softer in volume, but according to Sabian, they simply have certain frequencies removed. FR stands for Frequency Reduced. They are designed for use in environments where other ‘normal’ cymbals might be overbearing. It’s an intriguing development and we have the first bunch for review - 20" and 21" rides, 16", 17" and 18" crashes, and a pair of 14" hi-hats. The painstaking processes involved in creating a top-quality cymbal include the individual hand-poured casting of B20 ingots, removal of impurities and rolling a dozen times under intense heat. This is followed by shaping and trimming, lathing and buffing, followed by ageing, which allows time for the molecular structure to stabilise. In the case of FRX, the cymbals are fine-lathed top and bottom, with the exception of the bells, which are left raw. Subtle hammering creates gentle dips. Then there are the all-important holes, which create a completely new look. The machine-accurate holes are numerous, tiny and regular. Crashes have a single band of them, clustered around the edge of the bell and on top of the shoulder, while rides have a second band towards the perimeter. The hats have the fewest, with the bottom cymbal intact and the top with a single line of holes around the bell. The immediate impression is that the FRXs are not so much delicate as restrained and well-mannered. If that sounds a trifle prissy for a cymbal, it’s not that they are incapable of driving robust music - you don’t sense the lack of body you get with cheap cymbals. It’s a tricky concept to convey and each cymbal arrives adorned with a roundel bearing the legend, ‘Don’t Hold Back’. Sabian is at pains to explain the true nature of the instrument, you see. The message is to go at them as you would your normal set and the cymbals will take care of the dynamics. And that is exactly what happens. You play as normal and the sound is less obliterating than with an everyday set. The clue is in the title - Frequency Reduced Effects (FRX). There’s a sort of EQ’ing effect going on, although Sabian insists the moderated volume is more of a perception than reality. We’re used to holes in crash cymbals - Sabian’s O-Zones have large holes resulting in trashy lightning strikes. The FRX’s tiny holes have a different effect. All three: 16", 17" and 18" - crash cymbals are lightweight and the holes produce only the slightest of trashiness, more of a hissiness that translates as swift, smooth and clean. The three make a perfectly balanced set, deliciously sweet. The bells are extra lively too and because there are holes in them, if you strike over the holes you get an interestingly airy, bright and jangly clang - a fresh sound that is, frankly, pretty cool in itself. This leads us to the 20" and 21" rides. Their actual quality of sound and tone is different from other Sabian rides. Play them in the default (un-drilled) central area and you get a bright, yet full body with precise, stabbing stick response. It’s more metallic with a tinkly top end. You can indeed lay into them, when they open up without either washing out or becoming overbearing. And as with the crashes, there’s a contrasting effect to be had if you play them over the central pinholes (which again overlap into the bells). Here the air seeping through the holes seems to open up the sound to a vivid jingle, a proper ding-dong bell. Definitely something different and new. at the expense of your snare, so the slight overall reduction could definitely help with any recording. To sum up, the FRXs are pretty much as you’d expect from the description - a rather softer, more directed version of serious quality cymbals. Studios are an obvious setting for these cymbals. But also any musical setting that might call for a degree of restraint.